GB bemoans the demise of Rover - and on cue, questions are being asked of Directors’ salaries. How blind are the betrayed, to the billions up in smoke. A media weather-man (or person-thing) can take home €150,000pa. On Wednesday he/it advised that Saturday would be a scorcher; on Thursday he/it crossed his/its leaden heart that Saturday would be a scorcher; on Friday he/it swore on the life of his/its demon child that Saturday would be a scorcher; on Saturday itself, he/it told us that it was wet, freezing and blowing blizzards and batted not a hooded eyelid. God help us - take one emperor, take no clothes…..! 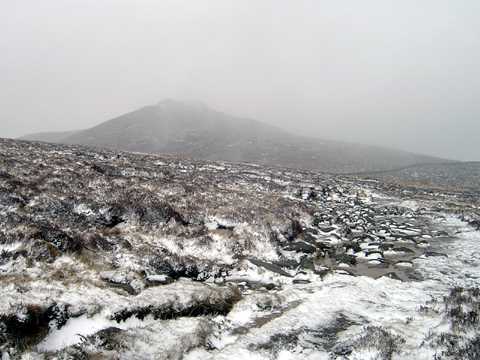 Scouring the Mournes on Saturday in full mental jacket, I am still not thawed out by Tuesday. Boy, it was rough - but somehow, perhaps in the face of adversity, the craic was ninety. Incidentally, there is now a bloke fell-running every Saturday with a Springer Spaniel, the first tired Springer Spaniel I have ever seen and deliriously happy. “Tomorrow’s supposed to be worse”, I shouted to a trio of dripping devotees. “Yes”, rejoined one, “tomorrow is the Apocalypse!”. A bloke from Mayobridge, AWOL for several unpleasant years, marching out manful new footprints toward higher and higher summits. Two desperados from Carrick (quite) giving it welly with some dear kit. A Scots bloke from Mull (standing soaked on Donard, he must have been amazed at the advances of civilisation since he last left that grey island). My highlight was however, a round young bloke coming off, who knows, Crossone. “Bad weather” he said - and given he was in a grey sweatshirt and Lidl gutties, he was well placed to comment. And so 1. the €150,000 a year Weatherthing or 2. the sweatshirt-clad round young bloke? Choices, choices.